I have decided that I love our vet. We have three 5 week old kittens who are sickly. We have given a couple around of antibiotics which we had gotten for a couple of the older cats. (we had been given some for kittens this young before so knew it was safe.) Every time they come off of it they get sick again. We did not want to take them in because every cat we have seems to have gotten sick so that our vet bill is up to 600 dollars. Mom called the vet told him what we they have been doing, wheezing, sneezing and running eyes. She also told him what we have tried. He listened said he would put them on a different antibiotics. He did not make us run the bill up higher by insisting we bring them in. Someone will pick up the new meds tomorrow. I hope it works. Good luck with that, and your Vet sounds like a good person. I'm headed to the dentist for my every six month cleaning. I like the hygienist and the dentist is ok, I hate having my teeth cleaned. My father had all false teeth, sometimes that seems like a good option! I'm in the last rounds of my fight against advanced periodontal disease. It's from years of neglecting my teeth. I lost one tooth and had to have my entire mouth numbed to have the rest DEEP cleaned. My "regular" dentist wouldn't touch me when I went to him for a cleaning. Instead I've been going to a periodontics specialist for the last several months. But he has thanked me the last two visits for making him look good, I'm doing that well. One final area to go, and we're waiting on the insurance company to get back with us on how much I will have to pay out of pocket for the final procedure. Meanwhile, my wife went the other route. She now has no teeth, and is TRYING to get to where she can stand to use her full dentures. She is NOT a happy camper. Only up-side to her whole thing is she has lost 15 or 20 pounds because she hasn't been able to eat. Discomfort-wise, I'm ahead. I only have that one final spot where it's a little sensitive when I go after it with the special brush. Her gums hurt, and her dentures make it worse. Money-wise, I've spent a LOT less than her, even with the multiple visits to the specialist. We took out a loan to pay for getting the last of her teeth pulled and getting the dentures. Still owe over $2000 on that loan. So I say no, keep your own teeth for as long as you can. Come down to Rolla, Mo. and go to Dr. Atkinson, my wife's and my usual dentist. He's called "The Dentist for Cowards". He's that good. Then get ahold of me while you're in the area. We can go to lunch! Thank you for the invite, that's really nice! I call it I take very good care of my teeth, at least the hygienist always says so and I haven't had a cavity in more than 20 years. Of course, when I was younger I was not so careful and my teeth are full of fillings. Perhaps there is no place left for a cavity to form?! I'm glad you are getting your own teeth sorted out and I hope your wife is able to tolerate the dentures soon. My dad had the opposite experience, he had a full set of dentures from the time he was about 50, lived to his early 80's with no problems with them and to my knowledge never had to have them repaired or replaced. I guess things were better made/made to last back in the late 40's! My daughter, granddaughter and myself should have gone to the dentist last week, but it was cancelled because she (the dentist I mean) was rushed to the hospital. I am calling tomorrow to see how she is doing and when we can get an new appointment . Definitely NOT a good day to go to the dentist aye??? I guess sharing a birthday is not the only thing we share? Happy birthday yesterday, btw! I've been on full dentures for many years. not from lack of care, but from a lack of vitamin D (my parathyroid glands don't work properly). My dentist made me sleep in them so that my body got used to them. reslt: I don't need to use any goo to hold them in place. I even have a spare top set, made as a 'horseshoe' rather than a full plate, especially for singing with as it leaves my palate free. Starting next month we will be working on pull my teeth. No real choice I am in a l lot of pain from teeth and jaw. I am hoping Medicade will pay for dentures. I've had one, did not understand that I have a bad reaction to plastic, and silica tried posting early this week, @Allen and the problems. More later. I'm also looking for a copy of <a href="http://encyclopedia.thefreedictionary.com/The+First+of+the+Few">The First of the Few</a> or Spitfire here in the USA for my dad. Last edited by GinnyStar; May 23 2015 at 02:06 AM. I don't know what is happening but my post was lost. I wish everyone the best with their dental issues small and large. May has been difficult for me and I am coping. I am often told how strong I am because I keep moving forward despite what the universe tosses my way. I hear them but I don't see it as strength because what other option do I have. It would not help me to curl up in a ball though it sounds good at times. I told Sharon's sister I would relay the information for her. It was hard enough that I ended up being the one that told her the news. I wanted to be able to let her grieve. I am glad I offered, but it is harder than I realized. Every time I have to tell someone, it brings it home again. I miss her so much. May everyone have a blessed weekend. The vet was wrong about was wrong with Oreo. Still not sure. Since there is no one there much on the weekend and there is not much that can be done I brought him home. He is not doing good at all. He is laying my chest not moving, barely breathing. Earlier he was have what I think was seizures. It is hard to believe how attached you can get in just a few weeks. I don't know what is happening but my post was lost. <snip> That happen to me also. Zen Hugs from freinds, Dan J and I.
I've been spring cleaning, while looking for something. I"m braille out notes, making print/braille labels using http://www.aph.org/products/aphont//http://www.aph.org/products/aphont// Using my new software, from American Printing House, and thinking of taking a course http://hadley.edu/ShowCourseDetail.a...rseid=UEB-101# while learning on a braille writer, helping out some else about my piloting a course about guide dogs. Share http://fbla.org/web/page/614/section...n_interior.asp as a former FBLA member and proud of it. Thinking of a lot of stuff. I was right about Oreo having seizures. They got worse over the last two days, nothing anyone could do. We lost him this morn. No more little nose or ear nibbles. I am so sorry, maw! We do love our animals! My condolances. It is always hard to lose a member of ones family. You probably don't want to think about this, but it might be a good idea to ask for an autopsy to verify the cause of death. It would be terrible if it were some kind of disease that had been passed on to your other animal family members. I know you think you understood what you think I said but I'm not sure you realize that what you heard is not what I meant. In Texas and Oklahoma they are getting far too much rain. California needs it terribly and here in CT we have had a very dry spring after a punishingly cold and snowy winter. We are finally getting some rain. There are aircraft used for fighting wildfires that can pick up water out of lakes etc. while flying. Too bad they can't get them in there, pick up water, aerially refuel and dump it in the California reservoirs. I just finished a necklace for Bardmaiden, from the NKT, Thought you all might like to see it. That's a dragon vein agate wrapped in argentium sterling wire. 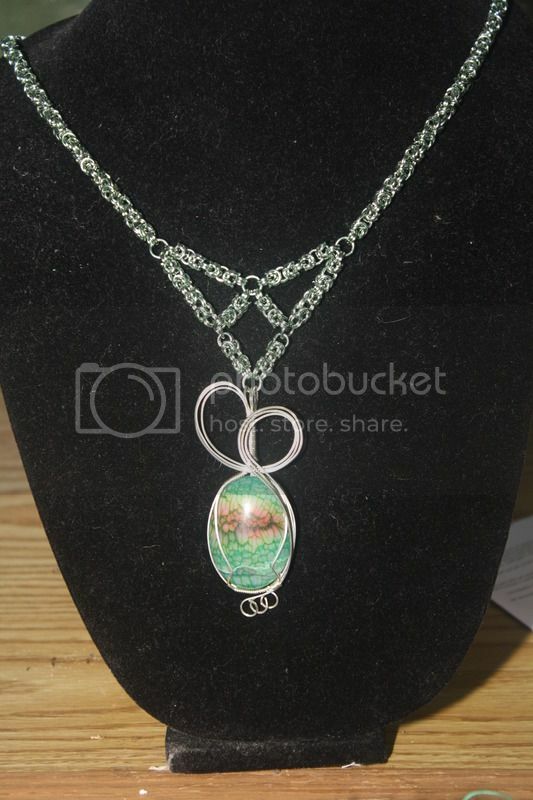 The necklace is anodized aluminum in seafoam green, byzantine weave. Oh, it was just a sort of half - fast thing I finally got together. Living in CA, I so wish it was possible too, Allen. There is a problem of scale. One aircraft load would not supply the Los Angelinos with a kettle full of water per household. I know distances are much greater in the States, but so are their resources. In the UK we've laid pipelines linking different water areas, so that wet Wales can send water to dry E Anglia for instance. The whole scale is way different as you said P'ter. As I've said on the nkt, if you drive the distance from Missouri to Florida in Europe, starting in northern Italy, with just a little weaving (but accounting for that in the mileage) you can touch as many as 5 or 6 countries. I meant that about moving the water sort of tongue in cheek, though. I think we should build some water pipes instead of gas lines. So you can pump the water from a flooded area to a drought area. That might be useful so it won't happen. So far all the other cats are fine, no sign of being sick at all. I hope it stay like that for a long time. Our vet bill is high enough don't want to add any to it. P'ter there can be a difference in scale between areas of the US as well. I've been living in Fort Wayne, Indiana long enough that it is "normal" to me . On the other hand I've meet people here from major cities (Long Beach, California and Newark, New Jersey) on both coasts who wonder where the city is at, and with a population of just over 250,000 Fort Wayne is the second largest city in Indiana. Another good example is the two hour on ramp to off ramp highway ride down to Indianapolis from here would just about get you to the eastern edge of San Diego county if you picked the freeway up at the eastern edge of downtown San Diego. As I said up thread I live in Indiana, but up until about 25 I lived in various parts of Southern California. You couldn't pay me enough to to want to go back there. Maw it is not because it is useful that it won't happen, but because it is not cost effective. I have done a bit of research on this and it would actually cost more to transport water from water rich areas of the US then build desalinization plants where they are needed and practical. However, our ever-changing and ever interesting environmental laws wouldn't allow the desalinization plants to be built anyway so that's a moot point. I don't know anything about horse racing except that I think the horses are beautiful and they spend hours blah, blah'ing before the race - then a frantic 1 1/2 minutes or so of actual race followed by more droning on. However, today was the third race in what is called the Triple Crown. It has been 37 years since the last horse won all 3 races, and it happened today that there is a Triple winner. He is only the 12th to win the triple crown according to the sport's caster. He won with no problems at all. Started out in first place and never looked back. He won by 5 1/2 lengths. Frost started out in 6th place and managed to come in 2nd. I thought that was a good run as well. Not much going on, arguing with Kibby as usual over stupid stuff. I got my second big disability check. This is for back disability payments. They decided I became disabled when I turned 50, but I did not start getting checks until 6 months ago. So I get three back check. This is my Dragoncon money. Hoorah for you and going to DragonCon! If we lived near enough to drive I might almost consider it. It just became too big and too much hassle with flying and trying to get any sort of hotel reservation. I do miss the art exhibit, dealer rooms and Emerald Rose. I know you'll have a fabulous time! One year I hope to go to Dragon Con. Wishing everyone an early enjoyable weekend. I think I've had as much enjoyment from dragon*con at a distance through friends who have been. I do not enjoy crowds or excessive heat and noise. And I did get to spend 5 minutes in Anne's company at a book signing some time ago. Carry on, all you lucky people, describing in detail what it's like!!!! Got five teeth pulled on Monday. Five more in two weeks, more after that. I know it will all be worth it when it is all done & I don't have any more infections and get dentures. Until then I feel like crap.